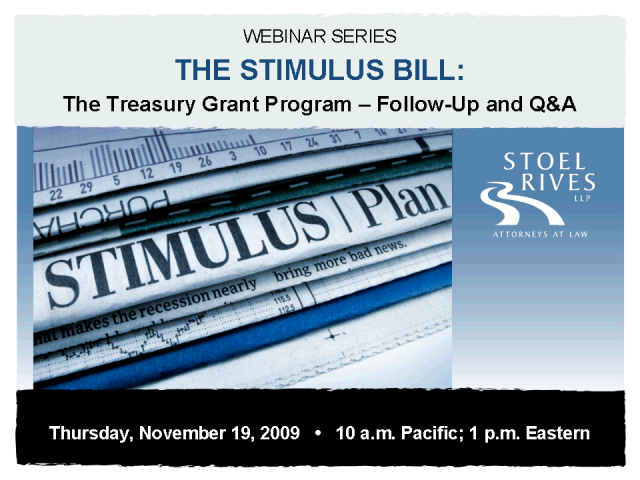 Due to popular demand, we have scheduled a follow-up webinar with Victoria McDowell that will further explore through an interactive Q&A how Treasury will interpret various standards relating to its grant program under Section 1603. Evaluation of the Water Bill Package and its land use aspects of the new Delta governance structure, focusing on the California's land use authority over the Delta, and the interplay between state and local land use decision-making. Review of the Water Bill Package and review of the five senate bills. The Stimulus Bill authorized an unprecedented level of discretionary federal funding for the renewable energy sector. This seminar will examine the compliance issues imposed on companies and organizations receiving Stimulus funds. Stoel attorneys will examine the Stimulus Bill reporting requirements, Davis-Bacon requirements, Buy American provisions and intellectual property issues. * How will Treasury interpret various standards, including starting construction and placed in service? * How will Treasury police recapture events? * What changes might be expected regarding disqualified persons? Join us for a discussion of these and other pressing questions. Making Good Marketing Claims - Product Labeling Pitfalls, Third-Party Certification, and "Green-Washing"